I recently had to make a screen capture for embedding into a Keynote presentation. As this sort of thing isn’t something I do often I didn’t really want to pay money for a program to do it. Luckily, something totally unrelated happened and I found the solution. 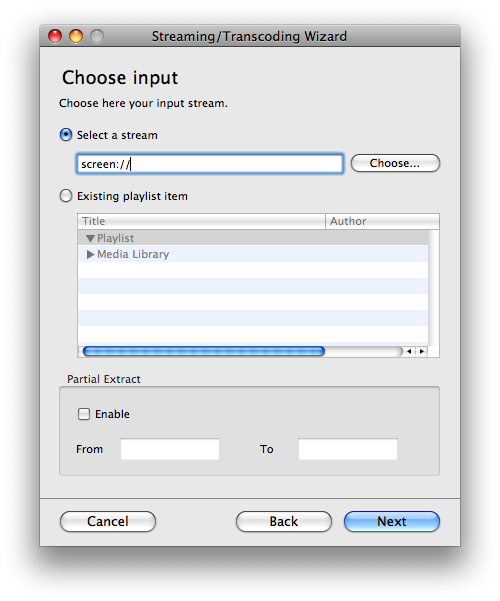 VLC, the open source media player was updated to version 1.0. It was one of those programs I had always had installed, but only ever used to play media files. As I was exploring the menus to see what was new, I discovered it was easy to be able to record your screen. Here are some instructions on how to do it. First you’ll need to download and install VLC. Choose the format and the bitrate. 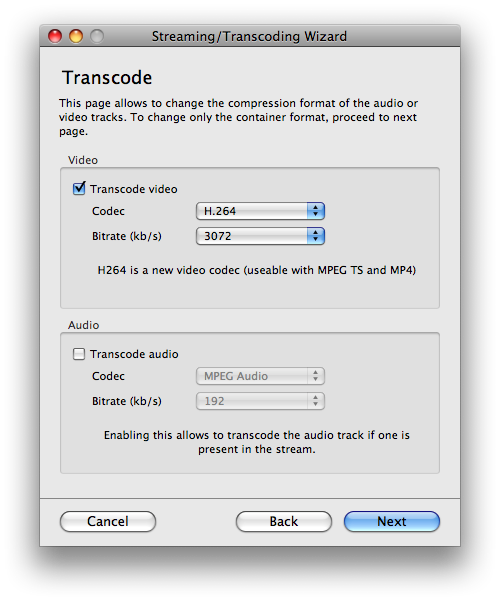 As I’m using a Mac I’ll choose H.264 and select a suitable bit rate. 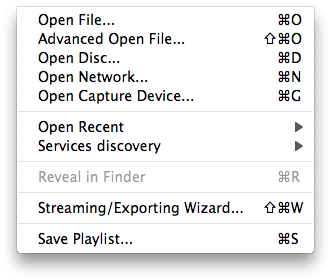 If you have audio you wish to include you can select the audio option as well. 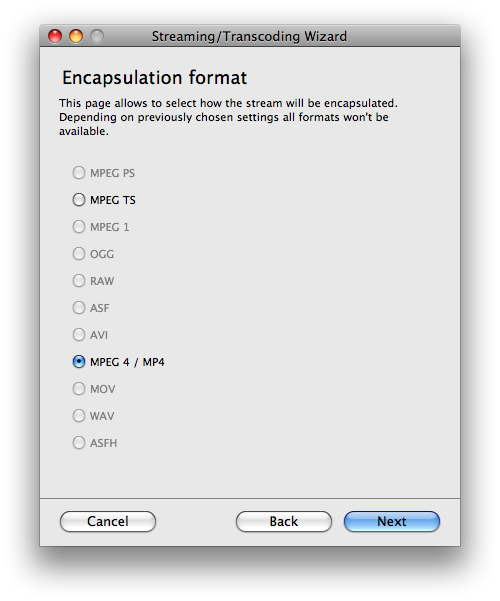 Select the method of encapsulation – for H.264 it’s good to select MPEG 4/MP4. Select where to save your movie. You’ll then be presented with a summary screen so you can check all the settings. 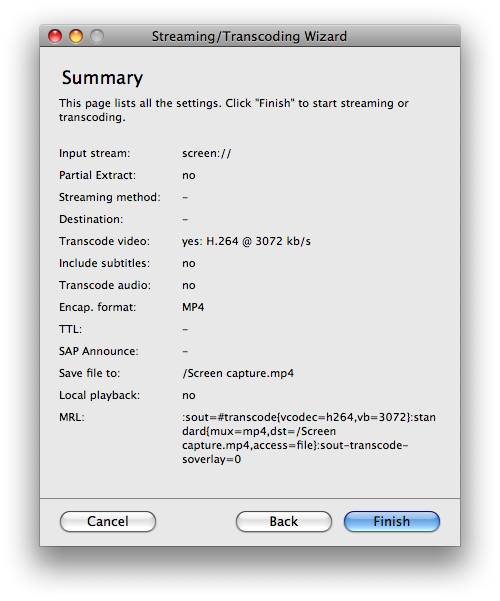 If they are OK, click on Finish and VLC will start to record your screen (including the mouse movements). Once you have finished recording, switch back to VLC and click the stop button. The recording will stop and the file is saved. You will probably need to trim the start and the end of the screen capture in another program as the screen capture will record you switching back and forth between VLC to hit the stop button. 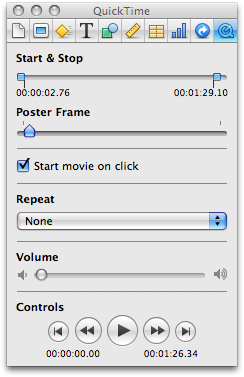 For instance, if you are using the screen capture in a Keynote presentation you can import the movie into your presentation and then move the Start and Stop markers in the QuickTime inspector to remove these portions. 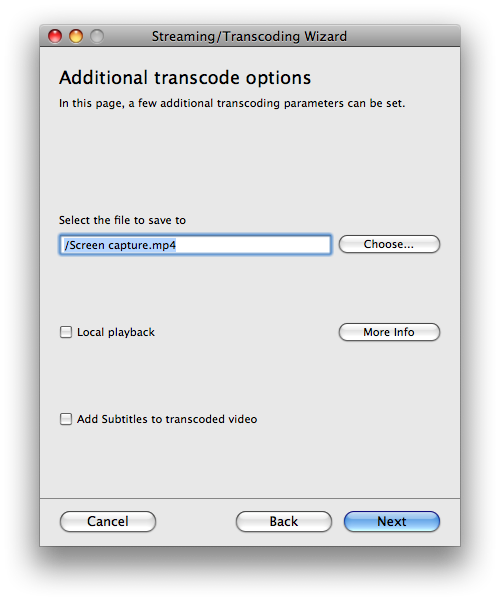 You’ll now have a beautifully created screen capture movie for your presentation. I hope you find this tip useful. This entry was posted on Monday, July 27th, 2009 at 11:24 am	and is filed under Apple, Blog, Tutorial. You can follow any responses to this entry through the RSS 2.0 feed. Both comments and pings are currently closed. I’m assuming it doesn’t also capture audio via the inbuilt mic? Thanks Paul. I haven’t tried to record an audio voiceover track directly in VLC. In the past, for screen casts, I have recorded a voiceover using Audacity and then merged the audio & video files inside iMovie (I’m using a Mac, but a similar video editor for a PC like Adobe Premier Elements would work fine). It’s a little bit more work, but this gives me a bit more flexibility in recording/editing the sound, separately to the video. Thanks, I used VLC with cameras and figured it must have a screen input. I like free. And Linux. I also run it on XP.